Tales of the knitty: Where does the time go? Another week gone in a flash and little blogging has been going on here. When I haven't been working, I have been helping out with some reading at school, and doing all the usual "mummy" things like taking the children swimming, tackling the K2 face of the ironing mountain and generally straightening out the chaos at home. Today I am having a catch-up day but have work arriving later to be turned round by tomorrow too! And all that is before I go on a school trip tomorrow morning with Ellen's class. There has, however, been late night and early morning knitting. 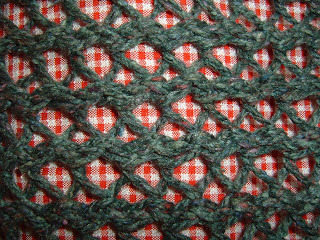 I finally finished my secret knitting - and here is a clue - any guesses? All will be revealed soon. I have just wrapped it up and sent it off to Melanie in Canada, my secret pal this time round. Hope she likes it! Once Beau is done, I want to get on with some knitting for Brigid's appeal for Kisiizi Hospital in Uganda, which needs clothes for babies. I want to knit some things for that and Stash are collecting the clothes for Brigid to pick up. The deadline is the end of August, so if anyone else fancies contributing something, all garments are gratefully received.